I have a question for you guys: which sounds more fun? Barracuda Ball or Shell Wars? Chloe, I like your idea of MerWorld! Sera and Amoure', I'm so glad you like my books. Marayah, can you tell I like dogs? 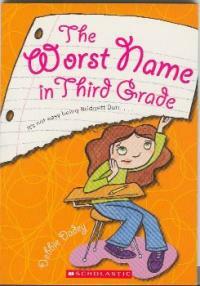 Bobo from The Worst Name in Third Grade is based on my dog, Bailey. Who knows Ryan, maybe someday Marcia and I will write an autobiography. Top of the morning to you all! 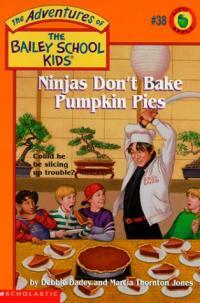 Dale, I'm glad you enjoyed Ninjas Don't Bake Pumpkin Pies. I guess the Navy Seals who found bin Laden were a bit like Ninjas. (My nephew used to be a Navy Seal). One of my favorite parts of that book is when the Ninja chop, chop, chops the pies with his sword really really fast. A big hello to Chloe and sister! Ian, I hope you'll try one of my stories. Do you have a favorite sport? Hi Angelina, Amarria, and Molly! Molly, I hope you have fun in Florida. Joseph and Christina, your ideas were so funny! Jennifer, Alexandria, Chelsea, and Charlotte I hope you guys will check out my writing page for tips. Just keep scrolling down for more. 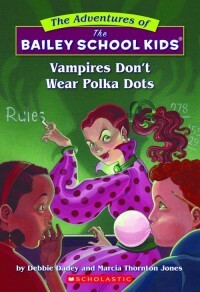 Savannah, I'm so glad you like Vampires Don't Wear Polka Dots. It was my first book! I was 27 when Marcia and I wrote it. Danielle, The Bailey School Kids series does hold a special place in my heart. Ian, I do like pickles alot. Kenna, I have 3 dogs. The kids I write about are made-up, but real kids give me ideas. 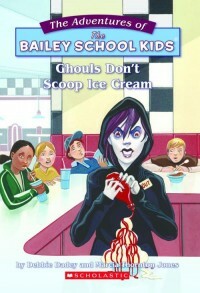 I have lots of favorite books, one is Ghouls Don't Scoop Ice Cream.